Bipolar disorder is a mood disorder that affects 2% of the population worldwide and is associated with high rates of relapse and suicide.1 Statistics on relapse rates show the difficulty of treating bipolar disorders; patients with stable bipolar disorder relapse into either mania or depression at a rate of 37% after 1 year and 60% after 2 years.1 Patients who have bipolar disorder can present with manic or depressive episodes, and the initial treatment depends on the presentation. Angst et al3 provide compelling numbers on the importance of treating bipolar disorder and other mental health disorders over the long term. Over the course of 22 to 38 years, their study followed 406 patients with bipolar disorder. The rate of deaths from suicide was significantly lower in those treated with maintenance therapy than in those who did not receive treatment (6 vs 27 deaths). The purpose of this article is to review the current best practices and recommendations for the treatment of bipolar disorder, including mania and depression, and for long-term therapy. Bipolar disorder is categorized as bipolar I or bipolar II. Characteristics of bipolar I disorder include manic episodes (Table 1). 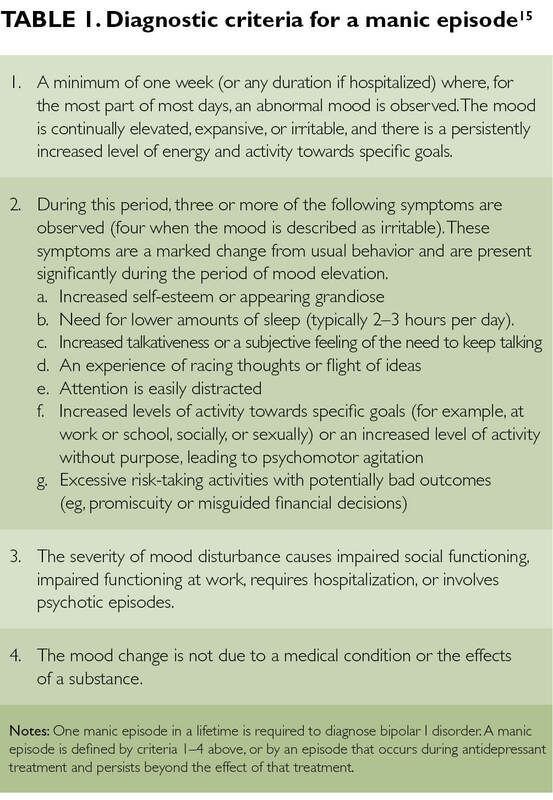 Patients with bipolar I disorder may also experience hypomania, as described in Table 2, and periods of major depression, as described in Table 3. 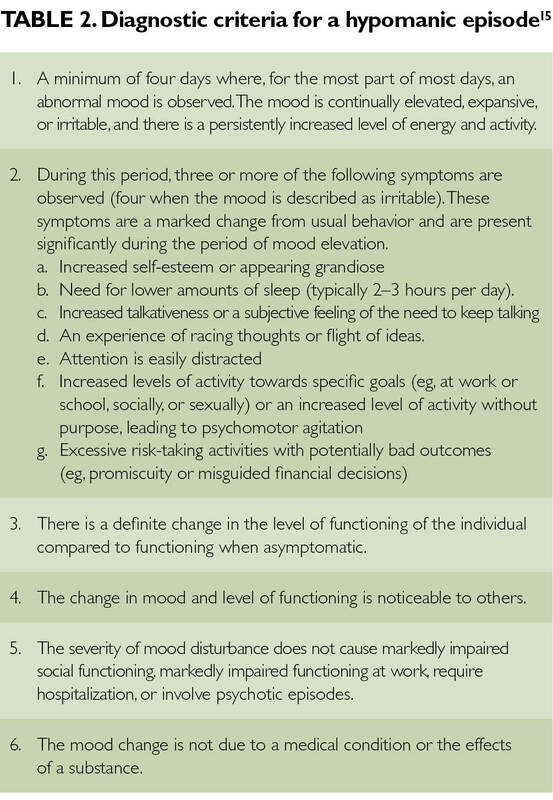 The diagnostic criteria for bipolar I disorder are presented in Table 4. Bipolar II disorder differs in that patients experience no mania but have at least one episode of hypomania and major depression.4 The diagnostic criteria for bipolar II disorder are presented in Table 5. This article researches the most recent meta-analyses and recommendations to arrive at conclusions for the best treatment options for patients with bipolar disorder. The author used PubMed, Google Scholar, UpToDate, and the American Psychiatric Association website to search for published articles. Search terms included bipolar disorder treatment, mania treatment, bipolar disorder management, and bipolar meta-analysis. Articles based on research directly sponsored by the manufacturer of a medication were eliminated, as were those with a perceived bias or marketing intention. Priority was given to articles completed in the last 5 years. Particular attention was given to articles that focused on medication efficacy and tolerability, and on direct comparisons of treatment regimens. Which of the following issues is the most difficult that you encounter in patients with bipolar disorder? Haloperidol, risperidone, and olanzapine are the best options for treating patients presenting with acute manic episodes, according to a meta-analysis by Cipriani et al.5 The meta-analysis included 68 studies of the treatment of acute mania, comparing the acceptability and efficacy of various antimanic medications. All trials included patients with a diagnosis of bipolar I disorder, and the trials were double-blinded. Researchers used patients’ rating of symptoms to define efficacy and patients’ discontinuation of treatment within 3 weeks after initiation of the treatment to determine acceptability. For the treatment of acute mania, haloperidol, risperidone, and olanzapine showed the best efficacy results, which were superior to those of 5 other drugs studied: valproate, gabapentin, topiramate, lamotrigine, and ziprasidone. For acceptability, olanzapine, quetiapine, risperidone, and haloperidol scored highest. Other drugs compared and found to have inferior acceptability were lithium, placebo, topiramate, gabapentin, and lamotrigine.